A recipe for a Liquid Gold cocktail, a hot mulled beverage made with pineapple juice, spices, rum and brandy. 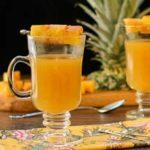 It is garnished with spiced pineapple cubes. Adjust oven rack to the middle position and preheat broiler. Line a baking sheet with foil and arrange pineapple cubes in a single layer. Combine sugar, Aleppo pepper, ground cinnamon, and salt in a small bowl. Sprinkle pineapple cubes with sugar mixture and toss to coat evenly. Rearrange pineapple in a single layer and broil until caramelized, 2 to 4 minutes. Transfer tray to cooking rack. When cool enough to handle, skewer at least 3 pineapple cubes onto each of 4 short skewers or sturdy toothpicks. Place allspice, peppercorns, cloves, and cinnamon stick in a medium saucepan. Stir over medium heat until fragrant, about 2 minutes. Add pineapple juice, rum, brandy, and vanilla bean and seeds and bring to a simmer over medium heat, stirring occasionally. Reduce heat to lowest setting and simmer for 15 minutes. Strain mixture through a fine-mesh sieve into a bowl and discard solids. To serve, place one pineapple skewer in eahc of 4 heat-proof cups. Ladle juice into cups. Recipe copyright © 2013 Quirk Productions. Used with permission.